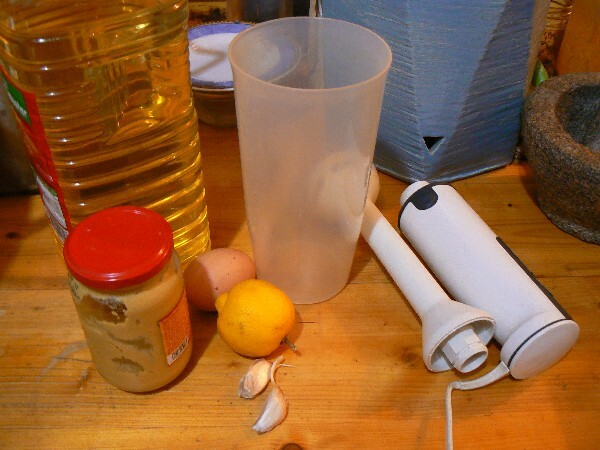 Home » Recipes » Making Mayonnaise in 2 minutes! Making mayonnaise is much easier than you think. 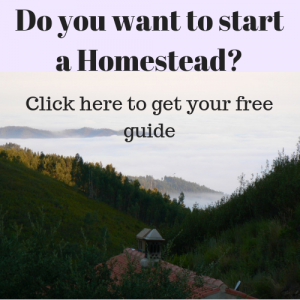 It hardly costs anything and you can make it exactly as you like it. Once you know how to make mayonnaise, you will never buy it again. And it only takes two minutes! 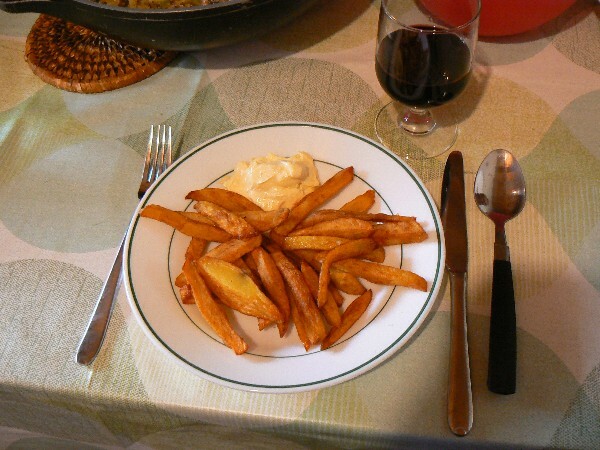 I learned making mayonnaise from Claudia from Andalusia. She did a three month Erasmus exchange on our farm. She is a good cook. 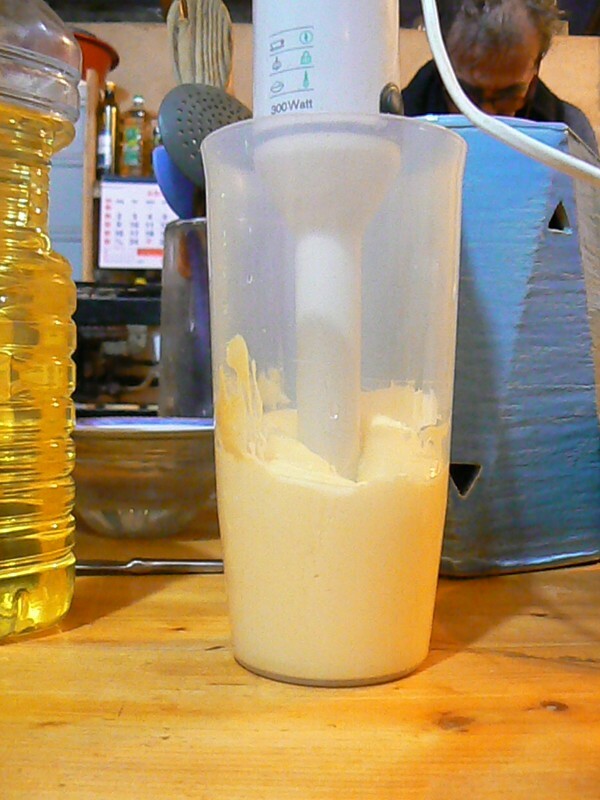 Sunflower oil, musterd, egg, lemon, a large high cup and a blender. 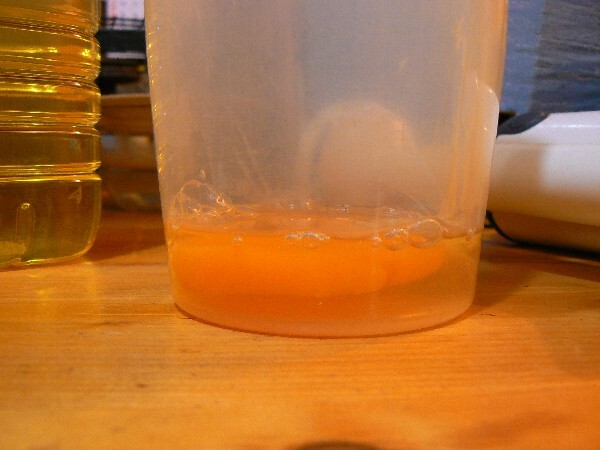 Eggs and oil need to have the same temperature. Add a tea spoon of musterd or more if you like and add the sunflower oil. 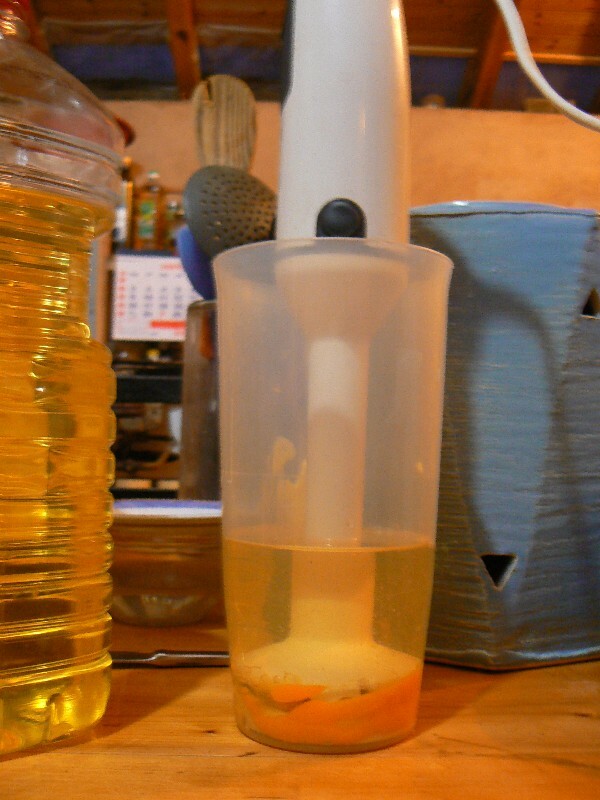 The amount of the sunflower oil is about 4 times the volume of the egg. Some people like to add more to make more mayonnaise from one egg. I like the eggy taste of mayonnaise so I stick to 4 times the volume of the egg. Than put the blender right down to the bottom of the large cup so it covers the egg. This is very important! 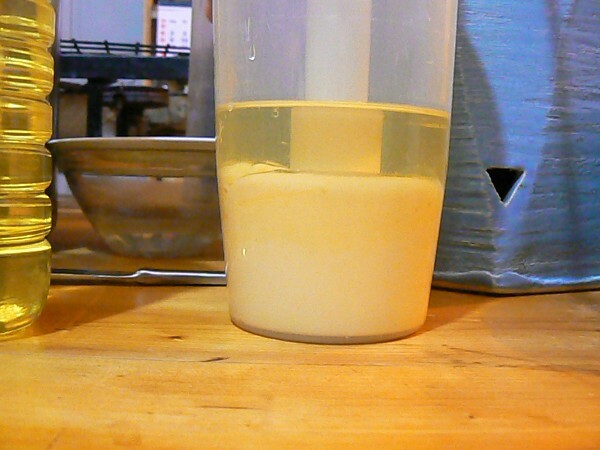 Sunflower oil 4 times the volume of the egg. Blender is right doen on the egg. Turn on the blender and keep it at the bottom of the cup. Wait until you see the mayonnaise coming up. Wait until the mayonnaise comes up. It is the white stuff in the cup. Then very, very slowly pull the blender up. Until you hear that the blender plops out of the thick mayonnaise. There might still be some liquid oil above the mayonnaise. Put the blender on again and push it back in the mayonnaise and move it up and down until all the oil is gone. Very(!) slowly pul up the blender. Add some lemon or vinegar. I add a tablespoon. It depends on how sharp you want the mayonnaise to be. Now you can add some garlic for making aioli. Salt, pepper, or bell pepper powder, or curry powder. You can use your creativity now. Just add everything on top and mix it all in with the blender, pushing it up and down. Do not put these things in at the start, it will screw up the process, just put them in at the end.